In 1945, a sealed earthenware jar containing thirteen leather-bound papyrus codices was unearthed in Nag Hammadi, Egypt. 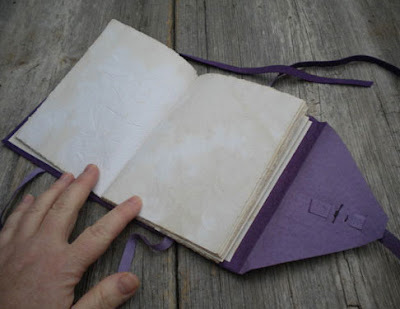 One of the books was burned and part of another; but, twelve books and some loose pages survived. These books were likely made in the 2nd century AD, and the writings are mostly Gnostic treatises, believed to be a library hidden by monks from a nearby monastery. This set of books has become known as the Nag Hammadi library. You can find MyHandboundBooks' journals and planners in her shop here: www.myhandboundbooks.etsy.com. Nice book, I like the vibrant choice of color! What a great story - it is so lovely to have a book with a story attached to it. 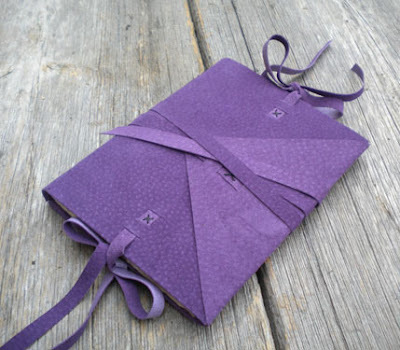 I love how you have matched a modern covering (mauve suede leather) with an ancient binding. It's a lovely book. Your books are ALWAYS gorgeous! You'd think I wouldn't be surprised when I see a new one, but I am impressed each time!